Robert Lewandowski and Thomas Müller were among the record makers at Bayern Munich while Bayer Leverkusen continued their remarkable scoring sequence and there was even a milestone goal for Borussia Dortmund's Shinji Kagawa on a weekend of top Bundesliga action. bundesliga.com rounds up the big numbers after Matchday 19. Schalke scored with their only shot on target in the first half with Marko Pjaca registering his first goal as a Royal Blue. Cologne made it three Bundesliga wins in-a-row for the first time since 2011 when they saw off Hamburg. Freiburg came from behind to win for the third time this term, no other team has managed as many comeback triumphs. Hannover's Niclas Füllkrug brought his goals tally in 2018 to four, making him the top scorer this year! He registered with his only shot against Schalke. Watch: Niclas Füllkrug speaks after his late equaliser against Schalke! Borussia Mönchengladbach's Matthias Ginter scored his fourth goal of the season - a personal best for the defender - a day after celebrating his 24th birthday. Gladbach may have lost their last three away matches, but the Foals are unbeaten in their last five at home [three wins and two draws] following their latest win against Augsburg. Freiburg are currently unbeaten in their last seven games [four wins, three draws], currently the division’s longest run without defeat. Bayer Leverkusen, meanwhile, are unbeaten in their last seven on the road, their best such sequence for over seven years. Gladbach defenders have combined to score a total of eight top-flight goals this term, a Bundesliga best. Stuttgart made it ten away games without a win this season, and have only one point to show on their travels this term. Eintracht Frankfurt have conceded at least a goal in their last 14 Bundesliga games, an unwanted feat unmatched by any other side. 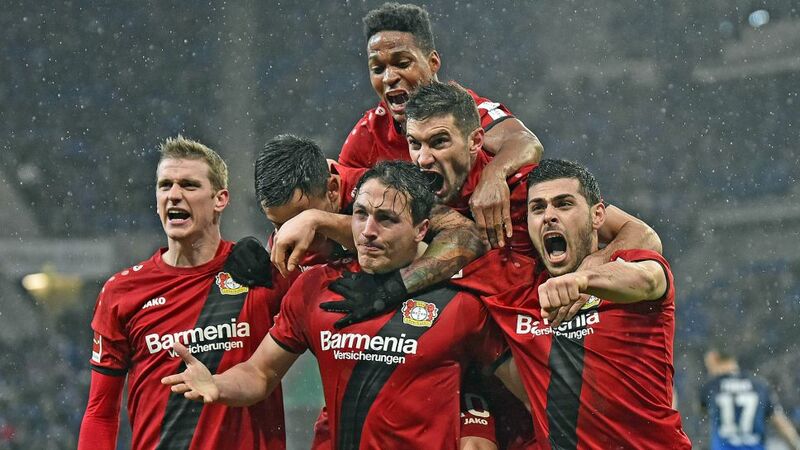 Julian Baumgartlinger became the 14th Bayer Leverkusen player to score for Die Werkself this season, no other team can boast as many different goalscorers. Hoffenheim’s loss against Leverkusen represented the 14th time – more than against any other team – the Sinsheimers have been beaten by the same opponents. Bayern Munich have now won their last 17 competitive matches against Werder Bremen, 15 of which have come in the Bundesliga. You won’t find a similar sequence of results between any other Bundesliga pairing. Leverkusen have now scored in their last 24 Bundesliga games, a sequence no other side can currently boast of and a club record for Die Werkself! Eintracht Frankfurt’s Luka Jovic scored the 30th goal from a substitute in the Bundesliga this season. USMNT international Timothy Chandler scored his first goal following a run of 58 games without finding the net. Before Saturday, the Eintracht defender last scored against Hoffenheim in May 2015. Cologne’s 91st corner of the campaign finally yielded a goal. In his 114th Bundesliga game for Bayern, Robert Lewandowski scored his 93rd and 94th goals, overtaking Arjen Robben as the club’s highest scoring non-German player. Thomas Müller scored his 100th Bundesliga goal, becoming the 52nd player in Bundesliga history to reach a century. For Bayern, only Gerd Müller, Karl-Heinz Rummenigge, Roland Wohlfarth and Dieter Hoeneß had previously hit 100 goals. Eintracht Frankfurt celebrated their 600th Bundesliga win. Werder Bremen have now suffered 600 defeats in the Bundesliga, a stat only previously owned by Eintracht Frankfurt, Hamburg and Stuttgart. In Friday’s 1-1 draw between Hertha and Dortmund, Shinji Kagawa scored the 20,000th away goal in Bundesliga history.